Local club Tupapa Maraerenga FC put on a great performance for the cheerful crowd, during matchday 1 of the OFC Champions league qualifying round putting away their Samoan Rivals Kiwi FC in the first game, 4-1. Tupapa sought to score early, by putting the pressure on right from the get-go. Their fast plays and effective player communication, helped them bag two goals scored by Harlem Simiona and Grover Harmon in the first 20 minutes. The Kiwi FC side determined to get back in the game, finds the back of the net with a penalty shot given by Tupapa. 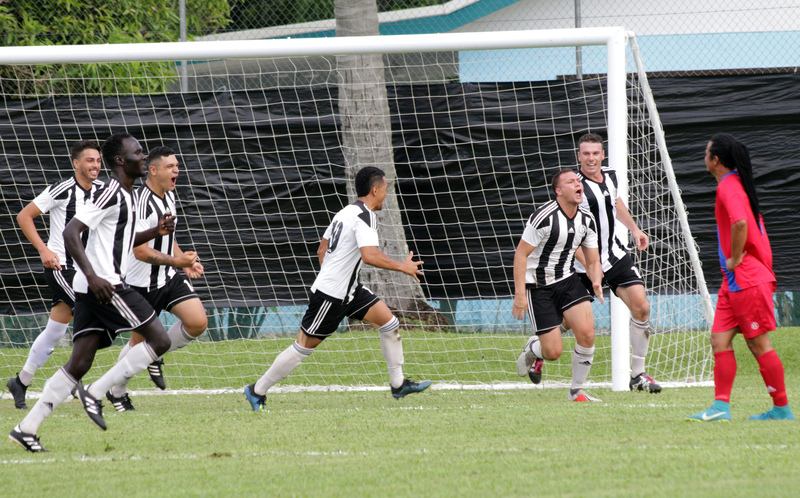 Tyrell Barringer-Tahiri put Tupapa back in a comfortable lead shortly after and Ben Mata sealing the game with the final goal of the match from a penalty in the 70thminute. As the game progressed, the intensity grew with players from both teams receiving cards for the untimely contest on the ball. Kiwi FC however, paid heavily by losing two players due to ill-discipline with 20mins remaining. Kiwi FC coach, Martin Tamasese said: “We still have hope for the two more games left, the boys know what happened here today is now finished, we just have to prepare for the rest of the tournament,”. Tupapa Maraerenga are to face off against Tonga’s Lotoha’apai United FC in their next match tomorrow at 5:30 pm. Lotoha’apai also put on a show for their fans by coming from behind to get 3 points on the table in a 5-1 contest against American Samoa’s Pago Youth FC. Kiwi FC will play Pago youth in the opening match of Matchday 2 kicking off at 2:30 pm. Previous Post EXPECTATIONS ARE HIGH AS FOUR TEAMS BATTLE TO QUALIFY.